The Goodman Gallery and the African National Congress may differ greatly on many issues, but the two organisations at least managed to find each other and broker an out-of-court settlement. After a bit of PR damage control by ANC spokesman Jackson Mthembu, it is now the SA Communist Party that has emerged worst from this. By SIPHO HLONGWANE. The ANC has decided to drop the court application that it brought against the Goodman Gallery and City Press after it met both organisations and a mutual understanding was reached. The newspaper has removed a picture of Brett Murray’s The Spear from its website and the gallery has promised to do the same at some point in the future. During a march by the ANC to the Goodman Gallery on Tuesday, the party’s secretary-general, Gwede Mantashe, told the crowd, after meeting with a gallery representative, that the gallery had agreed to remove the image from its website. The gallery’s lawyers quickly released a statement saying that no such undertaking had been made in the formal agreement between the gallery and the party. The message created some confusion as several reports stated that the gallery’s representative had definitely promised to remove the image from the website. 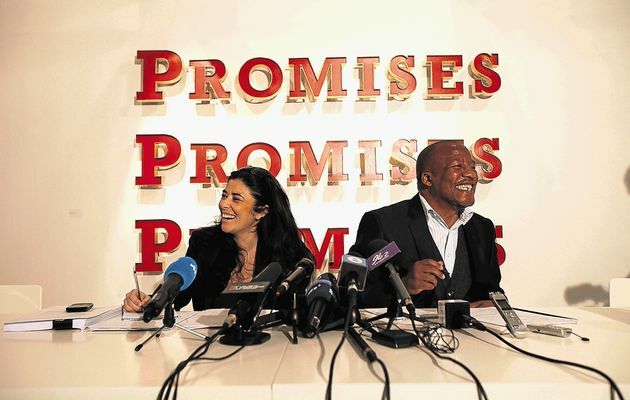 However, all was cleared up on Wednesday morning when Goodman Gallery director Liza Essers and ANC spokesman Jackson Mthembu held a joint press conference. Both parties agreed that a meeting of minds had occurred, that the ANC would drop its court bid because of the gallery’s decision to remove The Spear from display and to apologise for the harm caused. “I am saddened by the real hurt and humiliation caused to some people,” Essers said. “This was never our intention. “There is nothing mentioned in the agreement with respect to the website and the image. Both parties agreed from a legal and constitutional view to recognise each other’s rights. I’ve considered my own personal view and as a gesture of goodwill and also since the image has been widely distributed on the internet, I will take down the image at some point,” she said. The artist, Brett Murray, was also party to the settlement agreement, though he was not present at the press conference, and expressed his regret at the pain his painting may have caused some. Mthembu, for his part, welcomed the gesture. “We are South Africans too and we accept the (gallery’s) regret for the pain caused. We welcome and accept that, even though the gallery could have continued to display this painting in its defaced form, they’ve decided not to display it,” he said. Mthembu rejected the view put to him that the march on Tuesday was an intimidation tactic. He described it as the ANC exercising its constitutional rights. The ANC had not held a march since 1994, he said, and this therefore showed how seriously it took the matter. He said he too cried in court because the painting reminded him of the days when he would be strip-searched in the mines. More debate around issues of freedom of expression and the right to human dignity need to be held in future, Mthembu said. One of the most pressing questions we should be asking ourselves is if we’ve confronted our past and have we shed baggage so we can move forward, the ANC spokesman said. The Goodman Gallery will continue, in future, to exhibit art that was politically critical, Essers said, if that particular art fitted the curatorial context. The ANC spokesman said that though they hoped that artists would have learned from The Spear controversy, the party did not have the right to censor anybody. According to Mthembu, the ANC will not pursue everybody who has posted an image of The Spear online. The reason why the ANC went after City Press and the Goodman Gallery is because they are South Africans who would understand the pain and hurt that this painting can cause to some black people, whereas a random person from another country would not. He said that whoever posted the image now would be doing so knowing that it has caused hurt. “Maybe it is people who do not understand the pain and what it is like to be treated like a second or third-class citizen in the land of your birth. Our struggle was fundamentally about human dignity,” Mthembu said. The ANC spokesman said that the party would not be calling for the rest of the exhibition to be pulled down. Hail to the Thief II is due to be displayed until 16 June and some other art pieces have offended various leaders in the tripartite alliance. Mthembu said that though the ANC certainly didn’t take kindly to some of the art – one that seemed to offend him quite deeply was a bastardised quote of Solomon Mahlangu’s dying words – it would not interfere with the exhibition any further. The ANC’s talks with City Press and Goodman Gallery have made it come off with the strongest shine of all the tripartite alliance members. The South African Communist Party now looks like it went too far. SACP general secretary Blade Nzimande said the gallery should not send the painting overseas to its buyer, as this would be tantamount to repeating the Sarah Baartman horror. He ordered the gallery to destroy the painting.